Our God is a consuming fire. -Hebrews 12:29. The Christian Church needs not only true prophets, who speak the word of the Lord that they hear while listening in prayer, not only holy men, who speak the whole counsel of God, not only orthodox Reformed or Wesleyan expositors of Scripture. What we need are many, many FIERY HOLINESS PREACHERS! Men like Leonard Ravenhill, David Wilkerson, and Paul Washer; and we need hundreds and hundreds and hundreds of them! 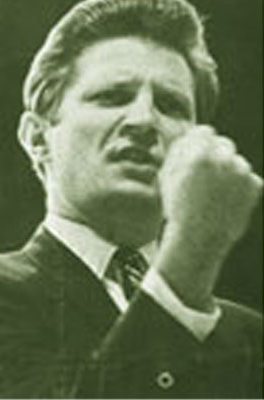 Men like this are marked by: (1) a disciplined prayer life, (2) a daily walk of godliness in which they resist the temptations of the world, the flesh, and the devil, (3) passionate obedience to the Word of God, (4) a missionary and evangelistic zeal to preach the true Gospel of Lordship Salvation, and (5) a love of Puritan and Wesleyan theology. Their heroes are street preachers, evangelists, revivalists, missionaries, or great reformers:–John Wesley, George Whitefield, Charles Spurgeon, William Booth, D. L. Moody, Charles Finney, Jonathan Edwards, Richard Baxter, Hudson Taylor, and intercessors like E. M. Bounds and David Brainerd. They give their lives to prayer and preaching: “continually to prayer and to the ministry of the Word” (Acts 6:4), so that by the time of preaching in the pulpit on Sunday morning, or the streets, or whenever, they have a sense of the “consuming fire” of God within them and upon them (Heb. 12:29). Wesley said, “I felt my heart strangely warmed.” The disciples: “Did not OUR HEART BURN WITHIN US while He talked with us on the road, and while He opened the Scriptures to us?” (Luke 24:32). “The Kingdom of God is within you!” said Jesus (Luke 17:21). Men who dwell on the holiness of God, are like the seraphim who gaze at the unapproachable light of God on the throne. They are called the “burning ones” because they are red-hot with the righteousness of God’s Spirit. So filled are they with His holy light, so hot are they burning, that they can think of nothing else to say, but “Holy, Holy, Holy, is the Lord God Almighty!” (Rev. 4:8). And they say that forever. They never hunger or thirst; they are constantly satisfied and filled and sustained by the holiness of God’s Spirit. It is sufficient. This makes it easy for holy men to fast. Can you comprehend what it would be like to be filled with the infinite energy of the righteousness of the Holy Spirit? To be filled with the power of the Spirit? The Holy Spirit is holy, because He is the Spirit of Holiness. If any man claims to be filled with the Holy Spirit, then let us ask, “SHOW ME THE HOLINESS!” Tongues and miracles are not good enough evidence of the Holy Spirit’s presence (Matt. 7:22-23). Holiness is the only true evidence; and all the fruit of the Spirit (Gal. 5:22-23). When preachers preach, they should release the power of the Holy Spirit to their congregation. There should be a sense of the fear of God, of holiness, of absolute reverence, and Puritan righteousness. The serious nature of salvation from Hell and sin should permeate every single sermon that they preach. They should preach it with godly fervency and absolute hatred for all sin. This may at times cause them to rant, to rave, to throw a fit of holy anger in the pulpit against unrighteousness, and even to POUND THE PULPIT WITH THEIR FISTS! This separates the men from the boys. This is the battle cry! This is the military march, the calling forth of the generals and soldiers of the Lord! “While Paul was awaiting them at Athens, his spirit was grieved and roused to anger as he saw that the city was full of idols” (Acts 17:16, AMP). FIRE IN THE PULPIT! The anger of God, implanted into the holy soul that loves God’s law with all his heart, and is incensed at the disobedience and blasphemies of the ungodly! FIRE IN THE PULPIT! The urgency and emergency of responding to the need to warn men of the judgment that will befall them all, and of the immediate danger of being thrown into the fire of Hell for eternity! FIRE IN THE PULPIT! FIRE IN THE PULPIT!! URGENCY! Oh God! What will it take to awaken the church from the namby-pamby sermons they must endure every Sunday morning? FIRE IN THE PULPIT! That’s what it will take. What will it take to make men see that God is real? FIRE! FIRE IN THE PULPIT! “Our God is a consuming fire” (Heb. 12:29). I have often gotten fiery, on various occasions, observing the Word of God maligned and mocked; the sense of fearful reverence that comes over people’s faces! They know how wrong and how convicted they stand before God. Let us fulfill all righteousness (Matt. 3:15). Jesus said, “Unless your righteousness EXCEEDS the righteousness of the scribes and Pharisees, you will by no means enter the kingdom of Heaven” (Matt. 5:20). Will you agree with the commandments that God has given? Will you try to keep His Word alive in your heart? (Heb. 8:10). Will you approach the God that Moses encountered on Mount Sinai? “His Word is in my heart like a burning fire!” (Jer. 20:9). Allow the supernatural presence of the Holy Spirit, and the Holy Law to enter your heart; it is of God. Jesus has made this possible; believe Him! “All things are possible with God” (Matt. 19:26). And preachers:–PREACH HOLINESS!